Holiday parties can be full of junk food, sweet drinks, and heavy desserts. Most don't consider healthy eating at a party, but definitely appreciate when healthy options are offered. 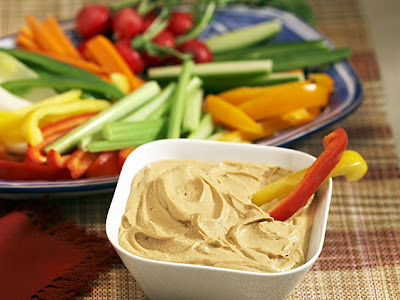 Try bringing a tray of veggies for dipping with this delicious, simple, healthy, homemade hummus from scratch and watch those party goers swarm! Put all ingredients in a food processor and process until smooth. Add more salt if needed. Process again. * You can substitute oil with 1/4 cup tahini paste, and slowly add water (about 1/3 cup) until desired consistency.